Centering the biological microscope substage condenser is an important step in order to view a clear and well-illuminated image. The condenser should be centered for best results. 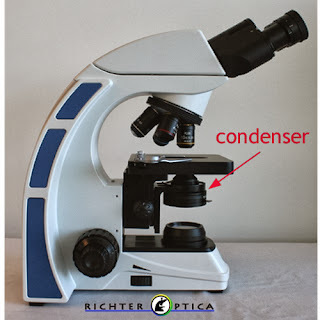 These are the several ways to center your microscope condenser. Typically the condenser has adjustment screws on either side that allow for centering. The center of the top lens can be marked with a small ink dot and centering is then performed by making adjustments to bring it into alignment with the optical axis. If the substage iris is attached to the condenser (this is common), the centering can be accomplished by observing the image of the closed iris with a low power microscope objective. Vertical condenser adjustment is also important. When using Kohler illumination vertical adjustment becomes even more relevant so that the image of the field diaphram is in the object plane. Typically a condenser is moved up into place beneath the stage as high as it will go. The substage iris diaphragm should be adjusted to allow the most amount of light possible without over-exposing the specimen. An iris diaphragm that is open too far typically results in an image that does not have ideal resolution.